What we need is a teaching tool that would demonstrate how the decisions we make support or destroy sustainability. Maybe it could be a game, one that would come with Lesson Plans. 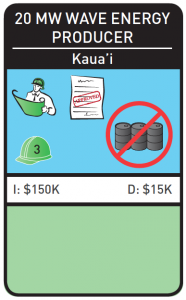 Oh, there is one: GBO Hawai’i is a sustainability themed board game for ages 13 and up. Imagine what would happen if a state adopted LEED standards for all new construction. In this board game from Green Business Owner, players get to participate in scenarios where policy cards that encourage LEED come into play as well as policy cards that discourage green building, for example, when a politician calls LEED a 'jobs killer' and public opinion turns against it. There are other policies that affect the bulding industry, such as state tax incentives for solar and trade policies that weaken and allow clearcut lumber to pour into the state from Indonesia. All the policies in the game were based in real life and are a minor pat of the game. Players get to invest in green businesses across the state of Hawaii in order to help the state become more sustainable. Through private sector investment in sustainable businesses, (a field known as impact investing), players are able to help the state of Hawai’i meet its sustainability goals, reducing fossil fuel consumption, advancing the local and organic food movement, and reducing waste generation. The objective of the game is to get the best triple bottom line return on investment. By investing in clean businesses, a player earns money (dividends) and creates green collar jobs, and also helps the state reduce waste and imported dirty energy. The most well-rounded portfolio wins the game. The Board Game and also the Card Game were developed with funding raised online through Kickstarter. t would be fun to see this adapted for Florida!